BRIEF OVERVIEW: Unsettled weather and gusty winds are currently over the eastern half of the Gulf associated with a broad trough of low pressure. This activity is expected to drift west into the Central Gulf through July 4. A weak front is over the NW Gulf and is expected to drift NW and weaken through the Gulf Cup. This pattern is expected to lead to moderate to fresh SE/S winds over the Eastern Gulf with lighter and more variable winds for the W and NW Gulf on July 4. 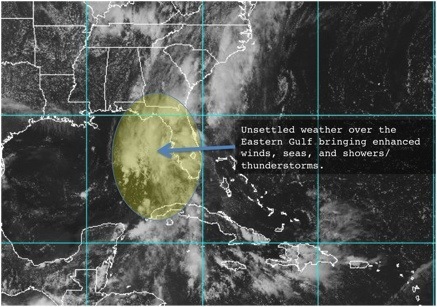 DETAILED ANALYSIS: The main item the Buoyweather/Fishtrack meteorology team is currently watching is the area of unsettled weather impacting the Gulf waters east of 87W. Widespread showers and thunderstorms are over this region along with gusty S to SW winds. This activity is primarily associated with an upper level trough of low pressure extending south from the Tennessee River Valley, which is supporting both a weak surface front over the NW Gulf and a surface trough over the NE Gulf. 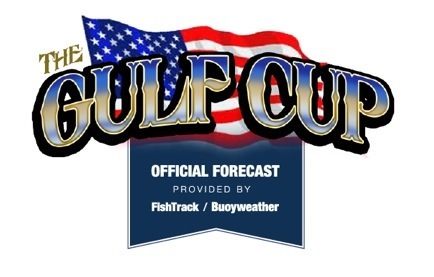 We expect surface troughing to drift W through the day of the Gulf Cup. As a result, moderate to fresh S winds and the main shower/thunderstorm activity will also shift W over the Central Gulf. 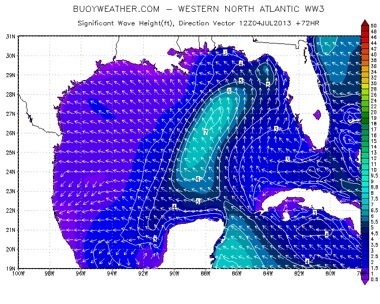 Contestants leaving out of areas between Pensacola, FL and Venice, LA should monitor detailed forecasts on Buoyweather.com to see how this may impact local conditions. Generally speaking, an area of 15-25kt S/SE and 5-7ft seas winds is expected over portions of the region between the Yucatan Peninsula and Central Gulf Coast/western Florida Panhandle. The potential for higher winds/seas also exists over this region in areas of enhanced shower and thunderstorm activity. Elsewhere, tamer conditions are currently forecast both well to the east and especially west of the above area over the Central Gulf. Much tamer winds/seas are forecast for the far NW Gulf as a decaying frontal boundary leaves light NE to variable winds over the region and seas mainly less than 3ft. Please visit buoyweather.com for detailed point forecasts. TROPICAL OUTLOOK: The above-mentioned unsettled weather over the Gulf is non-tropical in nature. Regardless of its classification, contestants should continue to monitor its evolution as it will likely lead to areas of enhanced S winds/seas and showers/thunderstorms. Otherwise, the tropics are quiet at this time. Figure 1. Visible satellite image from Monday afternoon. Figure 2. Wave height forecast for the morning of the Gulf Cup showing enhanced seas north of the Yucatan Peninsula, with lower seas over the SE and NW Gulf. Figure 3. 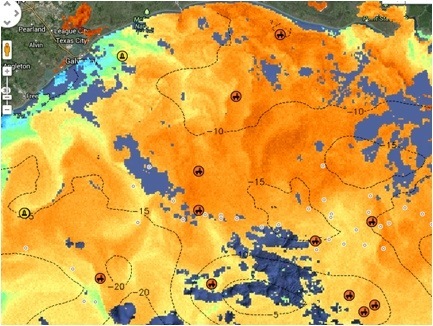 AVHRR SST chart from Fishtrack with Sea Surface Height altimetry contours overlaid.